And yet, gold investors could be forgiven for not feeling confident heading into the new year. The U.S. dollar’s resilience in recent years has been a limiting factor. Many official measures of inflation showed only modest price increases despite unprecedented growth in fiat money production. The London-based World Gold Council—one of the leading global authoritative organizations on the gold market—just released its 2017 outlook on global economic trends. The extensively researched document outlines the key macroeconomic drivers and their potential influence on gold prices in the coming year. In the European Union, business owners and policymakers are still unsure about the fallout from Brexit (which has, at the very least, haunted the British pound sterling). Italy, Spain, and Greece face severe economic problems. Critical elections will be held in Netherlands, France, and Germany this year. China’s once seemingly impregnable economy is deflating for the world to see. Decades of wasteful infrastructure projects kept unemployment relatively low and inflated official GDP figures but resulted in very little real economic growth. Now, the Chinese economy faces millions of displaced workers and poorly allocated resources. A major—and possibly painful—restructuring is necessary. Finally, the United States welcomes new President Donald Trump. Much of Trump’s future policy actions remain unclear, but it is widely known that he wants to drive down the value of the dollar to help U.S. exports. His pro-American industry policies threaten standing international trade agreements, which may force investors away from global equity markets. Gold is a haven during systemic crises because investors shy away from riskier assets such as equities and paper currency. The year 2016 saw the largest increase in gold-backed ETF holdings since 2009. The next three years saw a substantial spike in gold prices. Many power brokers, from Trump to the European Central Bank, want to see weaker currencies in their respective markets. The Fed may move to raise interest rates, but divergent monetary policy only adds to the uncertainty facing global business. No matter what official metrics such as the CPI state, most consumers faced consistent price increases throughout the Federal Reserve’s zero interest rate policy (ZIRP) period. Interest rates (in nominal terms) are likely to increase in coming years. The World Gold Council sees rising inflation expectations in 2017, and we agree with their assessment that such prospects are excellent for gold. Inflation often leads to rising interest rates. This makes bonds less appealing to long-term investors because there is an inverse relationship between bond prices and interest rates. Moreover, low bond yields tend to be less attractive in an inflationary environment. Gold benefits from high inflation expectations. It is not a secret that equity valuations are out of line with fundamentals, at least classically calculated. Slowing productivity growth and stagnating labor markets do not generally coincide with record asset prices, but that is precisely the scenario investors faced in 2016. Thanks to crippling low interest rates, savers and bond investors turned to more speculative assets, such as stocks, to combat poor yields. 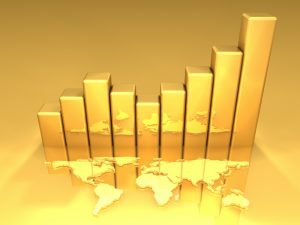 The World Gold Council argues that the risk of a correction (or over-correction) will increase in 2017. If bond prices fall as rates rise, expect them to be a less viable alternative to stocks than they have been in the past half-decade. Precious metals demand keeps rising in Asian markets. For example, the combined share of global gold demand in India and China grew from 25% in 1990 to more than 50% by last year. Hundreds of millions of Asian consumers hit the middle class over the past decade, which means record demand for class gold items in dentistry, electronics, and jewelry. Just as significantly, Asian governments and central banks look to detach themselves from the monetary hegemony of the U.S. dollar. Part of that strategy includes large gold purchases as a reserve for local or alternative currencies. India’s controversial decision to remove large denomination rupee notes–accounting for 86% of all of India’s cash in circulation–creates an immediate liquidity problem in the economy. Gold should benefit to the extent that the Indian economy suffers or Indian market participants begin to distrust paper currency. Never before have so many investors around the world had easier access to gold. Dramatic growth in private Chinese gold accumulation is expected to take place through physically settled gold contracts on the Shanghai Gold Exchange and Gold Accumulation Plans. Japanese pension funds have opened up to gold in recent years, with more than 200 defined-benefit plans and 160 defined-contribution plans. This mirrors activity among retirement plans in the West, where the definition of “diversification” continues to expand into alternative asset classes. Perhaps most importantly, the Muslim world is now open to gold investment in ways never seen before. Thanks to efforts from the World Gold Council, the Accounting and Auditing Organisation of Islamic Financial Institutions (AAOIFI) launched the brand-new Shari’ah Standard for Gold. Opening Muslim consumers and investments to gold investment is a monumental and underrated development.